"Montana is a Stand your ground state, you know," says a defiant looking Professor Josephine Baker to a couple of armed agents who've entered her home. Though Baker is unarmed, agents open fire on her. They empty their clips as they shoot her. What transpires is a scene toward the end of Destroyer #2, written by Victor LaValle and illustrated by Dietrich Smith. 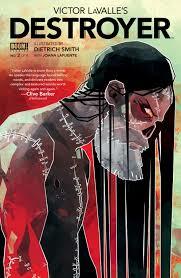 The story provides a contemporary telling of Frankenstein's monster seeking to wreak havoc on humanity. At the same time, the story presents Baker, an extraordinarily talented scientist and technologist, who has used her gifts to reanimate her young son, who was killed by police officers. I'll hold off on some spoilers for now, but let's just say that one of Baker's inventions shields her from harm. That protective invention is just one of her many ingenuous creations mentioned throughout the issue. LaValle is breaking new ground with the representation of this black woman protagonist in a comic book. In a way, we should expect new directions since there are relatively few black women characters in comics. It's bad enough where any appearance of a black woman character should constitute new ground, right? Or is that too cynical? These days, we already had two superbly intelligent black girls--Lunella Lafayette of Moon Girl and Devil Dinosaur and then Riri Williams of Ironman. Among adult women, we have folks like Storm of X-Men and Michonne of The Walking Dead. None of them have the sense of mourning and anger and perhaps vengeance that Baker possesses though. Baker's also credited with producing sophisticated equipment for the mysterious agency that's now pursuing her. At one point, an agent notes that Baker "designed nearly every piece of tech we use." It's one thing to present a smart black woman character in a comic book. It might be something else to acknowledge her technological contributions for an entire company or agency. Further, what does it mean that Baker might utilize her technological and scientific expertise to channel her grief and anger about the violent shooting death of her son. We're accustomed to viewing black mothers mourning after their sons are killed by police. LaValle is prompting us to consider a different response of a black mother.